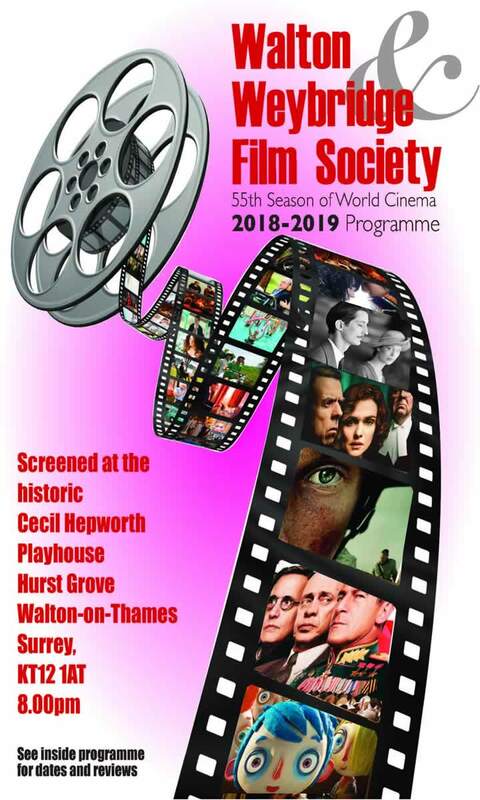 We meet at roughly three-weekly intervals on Wednesday evenings, commencing at 8pm at Hepworth Playhouse, Hurst Grove (off Hepworth Way), Walton to watch well regarded (mostly recent) films that have probably not been shown in our local cinemas. The Film Programme page shows the type of film we show. The venue is owned by Elmbridge Council and used mainly by amateur dramatic societies but it is also very suitable for film shows, with tiered seating and the usual amenities. Information about parking is on the venue page. Refreshments are provided without charge in a side room after each show and members are invited to discuss their reactions to the film with the Committee and other members. If you live in the Walton/Weybridge area, why not join us? If you would like to join our Film Society, please print off this application form and follow the information contained within. To help with the ever increasing cost of funding the society, we are offering the opportunity for local business to sponsor each of our 11 films planned for the forthcoming season. The sponsor will benefit from: A printed colour ad in the programme along with a credit for sponsorship which lasts the whole season. An advertisement placed on screen set to run on a loop for approximately 30 minutes in between the audience reaction from the previous film shown. Placement of promotional merchandise and literature within the foyer, plus two free tickets to their sponsored film. This will reach out to a large, mature audience residing in the Walton and Weybridge area.